Win The Complete Works Of Shakespeare - In One Poster! You are here: Home / Blog / Competitions / Win The Complete Works Of Shakespeare – In One Poster! Win The Complete Works Of Shakespeare – In One Poster! Our friends over at ExaTextPosters have come up with a great concept – posters made up of lots of tiny text. Not only have they created a poster of Shakespeare made up of his complete works, but they’ve also offered to give one away to one lucky NoSweatShakespeare reader! The Utterly Complete Works of Shakespeare poster features a portrait of Shakespeare – seemingly modelled on the Chandos or Soest portrait – made up of every word that Shakespeare ever wrote – that’s all 37 plays, 154 sonnets and 4 poems squeezed into just 24×18 inches. A total of 5 million characters of text! If you’re interested in winning one of these posters simply email us at NoSweatShakespeare (enquiries@nosweatshakespeare.com) with your name and address by 28th February 2015 and we’ll put your name into a draw to win. 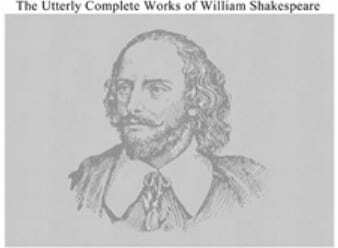 https://www.nosweatshakespeare.com/wp-content/uploads/2015/01/utterly-complete-shakespeare-poster.jpg 248 338 warren king http://www.nosweatshakespeare.com/wp-content/uploads/2014/01/nss-logo.png warren king2015-02-01 10:04:132015-02-01 10:28:32Win The Complete Works Of Shakespeare - In One Poster!